Have you ever thought about how your entire existence depends on the “outside” world getting “inside” of you? Think about it. You must breath in air, eat in food, drink in water, and take in light and sound in order to exist. At the same time you must get what’s inside of you out into the world in order to survive. All that air and food you took in also needs to go back out otherwise things might get messy. Further, ideas and desires need to go back out into the world if you to communicate any of your needs. What about your relationships? Have you ever thought about those? You didn’t choose your parents, siblings, aunts, or uncles. All of these relationships existed before you were ever conscious of them. But this is a two-way street. When you were born you made all these people your parents, siblings, aunts and uncles. Furthermore, your existence entirely changed and shaped the lives of those most intimately connected to you. Likewise, their existence entirely shaped your life. What about lovers? Ever thought about your husband or your wife? In a very physical way husbands and wives indwell one another. They take up each other’s space, eat the same food and even share the same bed. “The two shall become one flesh.” But this mutual indwelling between husband and wife can only happen if husbands and wives are distinct from one another. The mystery of their indwelling and “oneness” is based on the fact that they are different. They are unique, but they are also one. Are there any other aspects of our world that display this “mutual indwelling” that I’m trying to display? You betcha! Think about time. You’ve got past, present and future. Are past, present and future distinct from another? Can you distinguish between them? Of course you can. But past, present and future must also inhabit each other for us to understand time at all. Unless the past and the future inhabit the present there is not present at all. What about words? Do words also display this “mutual indwelling” that we’re seeing in relationships and time? Well you know the tune by now, of course they do! Again, each word in this sentence that I’m writing is distinct from all the others. Each word takes the stage of your mind and then humbly exists stage left to make way for the next word. Unless each of these words that I’m writing indwells the others these words would make absolutely zero sense. I promise we are nearing the end of the tunnel just hang with me for a few more! What about music? Many philosophers have bestowed a metaphysical weight to music. Think about it. If you’re in a room where music is playing, all of the music is everywhere in that room at the same time; in a way it's omnipresent. Music is much like time and words. Like time music can only be understood in its finitude. Unless music is transient like time there could be no music. Likewise, musical tones and notes are like words because they can only be understood in light of each other. Middle “C” can only be understood in and through its relationship with all the other notes. Could something as “theoretical” as ethics also display this theme of mutual indwelling? Again the answer is yes. The reason is because ethics is made up of distinct parts that must inhabit and indwell one another to form an ethic. Ethics must consist of the mutual indwelling of rules, situations and dispositions. To be ethical one must embody the correct action (rules) at the right time (situations) with the right disposition of the heart. If these things do not dance in harmony with one another you do not have an ethic. By this point you have no doubt noticed that this book review is departing from the normal modus operandi here at Torrey Gazette but I’ve done that for a reason. 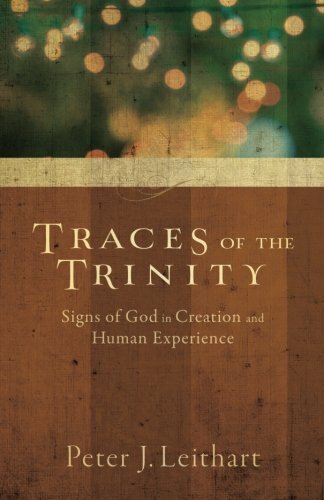 Peter Leithart’s book Traces of the Trinity is no normal book. To be entirely honest I teared up at one point while I was reading it. It is a truly phenomenal book. Leithart’s main aim throughout is to show the reader that our world is infused with traces of the Trinitarian God who created it. Moreover, Leithart desires that his readers begin to see these traces and conform their lives to the Trinitarian mold of the universe. Throughout the book Leithart speaks as though he is leading a trek up a mountain. Each chapter serves as a type of breadcrumb leading to the next trace. In leading upward, Leithart’s goal is to bring the reader to the final chapter where he expounds on the mutual indwelling of the Trinity. Apr 22 The World is "Ready to Hand"
May 4 Uniquely "Me" Because of "You"